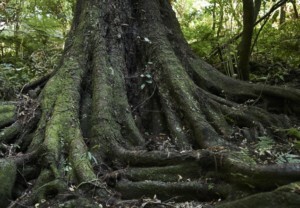 Kahikatea, New Zealand’s tallest tree, dates back to the Jurassic period and once dominated the forests that covered much of our swampy lowlands … in other words, our richest, fertile soils. Ravaged by fire in pre-European times, destroyed wholesale in the colonial rush to convert ‘wasteland’ into productive farms, and turned into butter boxes to ship refrigerated dairy to the Motherland, less than 2% of these primordial forests survived the last century. In Hawke’s Bay’s last remnant of alluvial kahikatea forest, near Onga Onga beside the Tukituki River, the trees are dying. One hypothesis is that they’re a casualty of large-scale irrigation, and the lowering of the artesian water table. But there are other factors too: neglect, exposure, climate change. I meet with Clint Deckard at ‘White Pines’ bordering the Inglis Bush Scenic Reserve, a rectangular 20-ha block surrounded by farmland in the Ashley Clinton district. If you haven’t heard of it, it’s probably because there are no tracks or facilities and public access stops short before a tangle of blackberry and a steep prickly drop into a swath of crack willow. Any feasible entry requires prior permission to cross private land. Originally from Australia, Clint’s lived in the area for some 25 years; his wife, Ngai, is a descendant of one of the earliest farming families here, the A’Deanes of Ashcott Station. But it was not until they moved back into the family home 3-4 years ago that Clint began to fully appreciate what was on their doorstep. The motivation was a tree-planting day at popular A’Deanes Bush reserve up the road, which has concerted restoration and predator programmes. He was astonished by the birdlife in contrast to the almost-silence at Inglis, save for the possums “we could hear every night”. “So, time to get stuck into it,” he thought, and started laying traps. He caught 142 possums in that first two months, bought himself a bat detector and at the end of 2017 set up the Inglis Bush Community Trust. From a garden seat on the Deckard’s lawn we survey the reserve: a small wetland ringed by ti kouka in the foreground, to the west the dense dark green of mature forest beyond the willow, to the south-east edge the younger forest regeneration Clint will later walk me through, guarded by thick buff totara and marked by a skyline of scraggly kahikatea crowns. Along with giant forest specimen like a 450-year-old matai, and the buttressed, intertwined roots of kahikatea, the reserve is home to a population of thumb-sized long-tailed bat (pekapeka), NZ’s only native mammal and critically endangered. Spotless crake, “an elusive wetland bird”, also on the critical list, have been sighted. 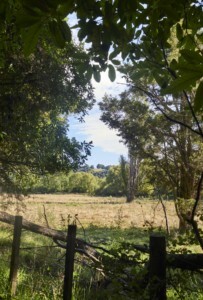 Once part of Inglis Farm, the remnant forest was purchased in 1979 by the Crown Lands and Survey department, given scenic reserve status around 1984 and placed under the auspices of the Department of Conservation. By the early 1990s, local Forest & Bird members noted a significant decline in the health of the kahikatea, coinciding with the drying up of local springs and disappearing wetlands, and the uptake of large-scale agricultural irrigation. An open intake drain from the Tukituki River, which cuts through the reserve, had been created in the 1950s to supply water to 12 farms; in 1987 a deeper gallery was constructed, inadvertently affecting the groundwater levels on the adjacent flats and draining the wetlands within the reserve. While rectifying measures were made, the open water race (which no longer fills from the Tukituki itself or is now even drawn upon) continues to siphon water away from the visibly struggling kahikatea in the south-east corner of the reserve, as it flows out of Deckard’s farm holding. The report recommended compensating for water lost to the reserve through extraction by irrigating the reserve from upstream river takes (at 10 litres per second), or alternatively incorporating this measure into minimum flows for the Tukituki at the Hwy 50 Bridge. The recommendation was never acted upon, although the other suggestions were, such as monitoring water levels in the water race. Clint says he’s found the pipe trail of monitoring sites but the area’s now completely dry, no longer a water way at all. From 3 million cubic metres in 1990, consents to extract water from the Ruataniwha aquifer for irrigation rose to the present 28.5 million figure, with a further 15 million applied for under the Tranche 2 provision in Plan Change 6. More and more trees are dying, says Clint, “With every storm we lose another”. The view from his window shows a thinning canopy. Certainly, as he sees it, taking a further 1 million cubic metres of water per year from an already over-allocated aquifer (as applied for by neighbouring farms under Tranche 2) “won’t help” the situation. CHB District Council owns 5.6 ha on the north-west boundary of Inglis Bush – currently leased to a dairy farmer. Clint would love to see that reforested, as recommended in the DOC Restoration Plan for Inglis Bush (Nov 2017), and is petitioning council to take up the cause, or transfer the lease to the Inglis Bush Trust. 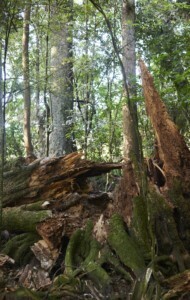 Having trees around the reserve would afford it more protection. To this end he is gradually retiring his own paddocks around the south-east boundary which backs down to the Tukituki, with the intention to replant with seedlings eco-sourced from the area. The regional council set up a Tukituki Water Taskforce last September, which aims to come up with “a beefed-up Ruataniwha Groundwater Plan”, says HBRC’s principal hydrologist Jeff Smith, now that the dam is off the table and contention around the allocation of a finite resource has sharpened. “We don’t want to rush into short-term fixes,” says Smith. “It’s more efficient and effective that we evaluate all the problems, and ideally find the solution for everyone.” And while localised solutions to local variability within the Ruataniwha Basin may be required – he says the original 1996 proposal to augment water flow into Inglis Bush is “definitely a consideration … we’re working to find an overall strategy”. “Through our modelling, it’s very clear that the groundwater abstraction is having an impact on stream flows.” But he’s hesitant to draw any correlation to dying trees. With Inglis Bush, “we need to investigate the cause”. That agricultural irrigation (through lowering the water table) is impacting the reserve is not conclusive, he says, but rather “informed speculation”. HBRC is preparing comprehensive groundwater and surface-water models, as with the Heretaunga Plains, which will enable better understanding of the dynamic. Hawke’s Bay has one of the most diverse range of ecosystems in the country, with 59 different ecosystems, but it’s also one of our most denuded regions, having lost most of its vegetation (90%) and wetlands (98%) since human settlement. Only fragments remain. 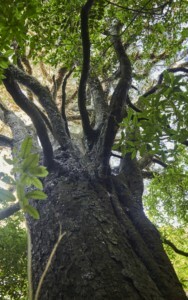 Inglis together with A’Deanes Bush (the 40-ha reserve 3km further west on the Tukipo River, home to the largest totara in the North Island) make up an Ecological Management Unit under DOC’s Nature Heritage Management System, and as such are deemed “a high priority for protection”. But what strikes me is that without individuals like Clint, who actively, boots-and-all, cherish this heritage, nothing much would be happening. Kay Griffiths, a former DOC ranger and programme manager, is now project coordinator for the restoration of A’Deanes Bush under her own business, The Conservation Company. She concedes work on the ground itself has been more or less left to philanthropic and community initiatives. The work at A’Deanes, for instance, is privately funded by a generous benefactor and locally supported by the community and Sherwood School. “As DOC has been more and more squeezed, with restructure after restructure, lots of small places have fallen off their priority lists.” DOC’s Onga Onga Field Station used to have 4-5 permanent staff, as well as temporary staff during peak times, but with funding slashed and management roles prioritised under the previous National Government, DOC was shrunk to one centralised Napier office, meaning no one on the ground in CHB. “And if you don’t have local people pushing the issues,” says Kay, they get forgotten or submerged in the bigger scheme of things. While these are relatively small remnants (down nearby Gwavas Road there’s the largest podocarp forest remnant in HB, Puahanui, at 130ha), if you compare them to the QEII covenants on private land, which average 4 ha and in isolation are incredibly vulnerable, says Kay, they are still sizable. Riflemen (NZ’s smallest endemic bird and nationally at risk) were introduced back into A’Deanes Bush five years ago, but Kay says it’s “not looking flash” – there are individuals but no families, which suggests that to thrive they need a larger (forested and predator-free) area. Mark Mitchell, HBRC’s biodiversity team leader, says “little gems” like A’Deanes and Inglis Bush are hugely important; they show us how the landscape once looked and provide valuable data as well as habitat. The regional council, together with DOC and ecologists from across Hawke’s Bay, is compiling an ecosystem priorities list for the region as part of its Biodiversity Strategy Plan – so far over 900 potential sites have been identified, each needing active management and work. A finalised list will be released later this year. It’s not of itself an on-ground strategy, explains Mitchell, but “a way of elevating the importance of these remnants” and will help direct future efforts. We can plant trees all we like, he says, but we can’t recreate the forests with their root-zone and fungi networks that have evolved over hundreds of years. As science is increasingly discovering, a forest is not just a stand of trees, but a complex ecological community. At this stage, Mitchell can’t say whether Inglis Bush will be on HBRC’s ecosystem priorities list or not. At this stage, the outcome of Tranche 2 consent applications, recommendations from the Tukituki Water Taskforce and how the rights of trees will be included in the Ruataniwha Groundwater Plan are unknowns. At this stage, with climate change in the mix, potential canopy collapse ahead, and a national decline in forest health, the long-term future of Inglis Bush looks fairly bleak. But meantime Clint Deckard is learning about seed collecting and propagation. He’s continuing to actively monitor the Reserve and to lay and check traps on a weekly basis. 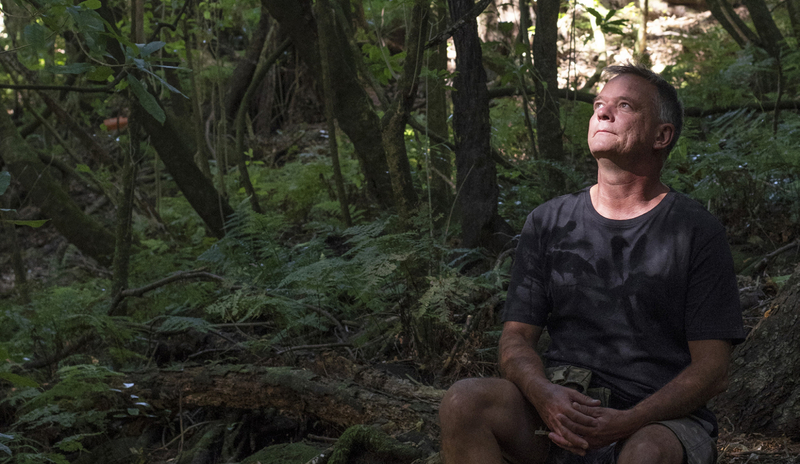 He’s continuing to vocally advocate for the kahikatea. Clint has never thought of himself as a greenie, but he loves this piece of bush and will do everything he can to give them a chance.